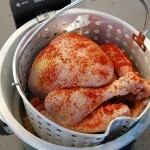 The bird is first injected with the Cajun spices, marinated overnight, then deep fried in less than an hour the next day! You will need the following equipment: A pot with basket, burner and propane tank; candy thermometer to measure heat oil; meat thermometer to test turkey doneness; safety goggles; fire-safe gloves and pot holders; fire extinguisher; seasoning injector. Heat oil to 375 degrees F. Depending on the amount of oil used, this usually takes between 45 minutes and one hour. While the oil is heating, remove turkey from marinade and pat dry with paper towels. 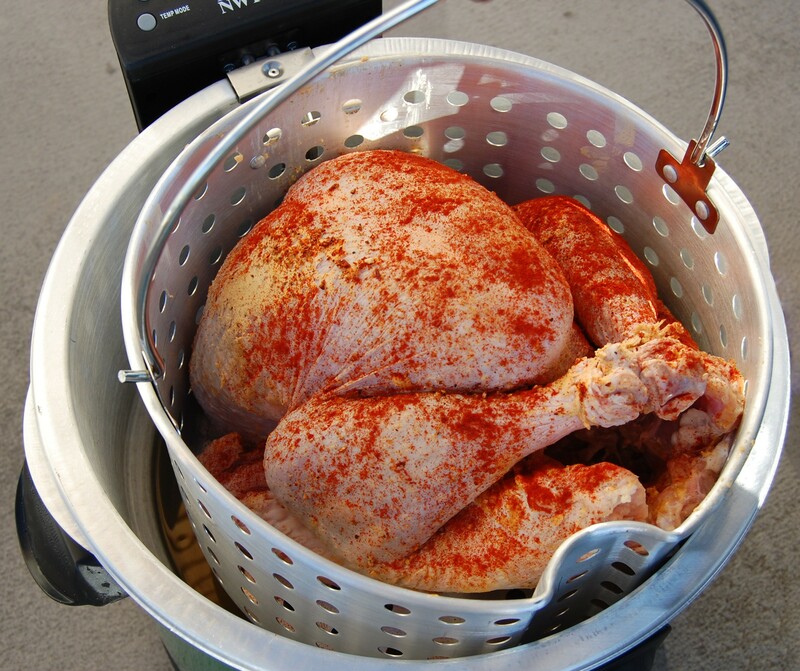 When the oil has come to temperature, lower the turkey into the hot oil slowly using the hanging device that comes with turkey deep-fryers. The turkey should be completely submerged in the oil. Cook for 36 minutes, or 3 minutes per pound of turkey. The turkey is done when the temperature in the thickest part of the breast reaches 165 degrees F and the thigh reaches 180 degrees F. Turn off the flame and slowly remove from the oil, making sure all of the oil drains out of the cavity. Allow to rest on a serving platter for about 20 minutes before carving.